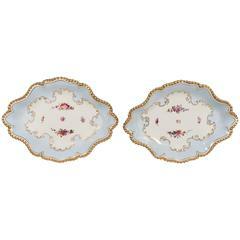 A pair of antique Imari inspired Coalport porcelain oval shaped dishes hand-painted in an English pattern known as the "Peony" pattern. The wide border features songbirds and flowers in panels. The center of the platter features a large peony. The "Peony" pattern it is a vibrant example of Regency porcelain which was inspired by 17th and 18th century Chinese and Japanese porcelain. 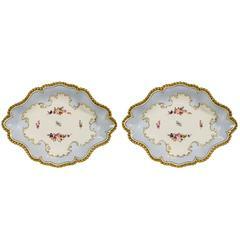 Made in England, circa 1810 this pair of platters are hand-painted with cobalt blue, iron red, and lavish gilt. Dimensions: 10.5 inches x 8 inches Condition: Excellent Price for the pair: $900 In the shop, we also have a large square dish 9.25 inches x 9.25 inches, and a saucer dish 8.25 inches diameter in this wonderful pattern (we are happy to provide images and pricing on request) History of Coalport: The Coalport porcelain manufactory, was founded by John Rose in 1795, at Coalport, served by the Coalport Canal. Rose had trained at the Caughley porcelain manufactory in Shropshire and had been making pottery on his own account since about 1780. His rapid success enabled him to buy the Caughley manufactory in 1799, the Nantgarw porcelain manufactory in 1819 and the Swansea porcelain manufactory, with their repertory of moulds. He employed the talented William Billingsley, formerly at Nantgarw, as chief painter, and Billingsley's chemist, Walker, who brought the Nantgarw technical recipes to Coalport.